I’ll be honest I never liked history at school, the teachers never made it interesting enough for me and I simply zoned out nevertheless it’s never too late to learn and that’s exactly what I’m doing with this new series of historical themed posts on the blog. 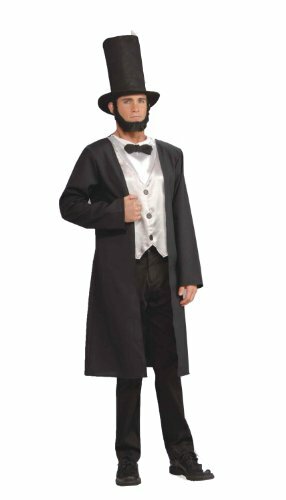 Today we’ll be focusing on how to create your own Abraham Lincoln costume, a great patriotic choice for kids and adults, great for history plays at school to fancy dress and Halloween. Abraham Lincoln was know as being one of the Presidents of the United States until his assassination in 1865. It was a short but sweet reign that cemented him in the history books for the work he did in that time becoming known as ‘Honest Abe’. Most pre-made costume kits includes Abraham’s top hat, beard and suit and so we can use that as a guide when creating our own outfit. Here is a different outfit to the one pictured above that has a deluxe look to it complete with vest and dickie, black coat, pants, hat and bowtie. The only thing not included is his beard which can be purchased separately and attached using spirit gum. 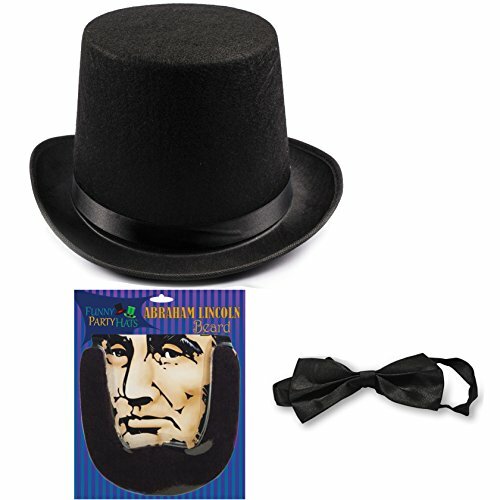 For all the men who want to dress as Honest Abe there are also cosplay sets available for you. Here are two choices that will work well. First off you’ll need a black suit, these are easy enough to come by but it needs to be pretty elongated going down to the knees. Pair this suit with standard black pants, perhaps you already own something suitable. Then a white shirt or waistcoat similar to the one in the image above would work well. Finish off with a black neck tie from a spare length of black ribbon and a pair of black dress shoes. Top hats are easy to find in vintage or thrift stores, try to find one with a long cylinder for dramatic effect also known as a ‘stovepipe hat’ which is a tad longer than regular. If you’re looking for a specific top hat to use then this is an appropriate choice, as mentioned above this is a ‘stovepipe’ type hat but in adult size (not for children). Next let’s move onto facial hair, an important part of any Abraham Lincoln costume. Gather a black beard from a local fancy dress store and attach it to your face using spirit gum, glue extra hairs along your face to create a natural finish. Besides the beard, keep your hair fairly short but bushy at the same time with eyebrows equally as bushy. Time for a history lesson as promised, I’ve researched and it seems Abraham much preferred reading and learning to working with his hands in the fields unlike this father who was the polar opposite. He’s also known for being incredibly humble, even bringing down the local bully as a kid. As a final accessory to your outfit and as testament to his character carry a book along with you like the first image above. An old history book would make a good choice. That would be an interesting costume choice and not too too hard to put together! Agree! History was never my favourite subject, but it is always cool to dress up and play a part in a role – even if it is history related.